It's not every day that Robert Kirkman lets someone else do a 'Walking Dead' story but that's exactly what we have here with 'The Walking Dead: The Alien.' A digital one-shot exclusive through PanelSyndicate.com where you name-your-price and it's been created by Brian K. Vaughan (Saga, Y: The Last Man) and Marcos Martin (The Amazing Spider-Man, Daredevil). Not a bad team to hand your baby to. That baby has grown into a monster. The main series from Image Comics is continually a best seller now at over one hundred issues and the blockbuster television adaptation on the AMC network is a ratings behemoth with huge social media buzz. Panel Syndicate worked out a deal to publish a stand-alone in-canon story to be sold through their site in exchange for Image Comics publishing Vaughan and Martin's highly acclaimed webcomic The Private Eye in print. You can consider this "The Walking Dead International" as the story takes a global perspective from Spain revealing the zombie apocalypse is worldwide. Jeff is an American waking up in Barcelona and witnesses a young boy get devoured by a group of walkers and he himself barely escapes being next were it not for Claudia. The local museum curator rides up in a scooter and medieval armor and virtually says "Come with me if you want to live." Claudia's cool and steady demeanor is a great contrast to Jeff's freaked out state. She's got a plan to get them out of Spain and Jeff back with his family in the U.S. Their chemistry is natural and almost romantic were it not for the countless undead people roaming the streets below her apartment and all. She's upbeat and confident making her a magnetic protagonist. Jeff wisely chooses to follow her lead. It's not easy following Charlie Adlard's signature look for the established Image series but Martin does amazing line work that, like the spin-off show "Fear of the Walking Dead," opens up a completely new world within the 'Walking Dead' universe full of new landscapes and dangers. The fluid and dramatic staging of the black-and-white panels give way to a shocking use of color for the first time at the end. It's at that moment in 'The Alien' that it connects to the main series in surprising fashion. As a stand-alone short story, this gem hits all the right spots conveying all the confusion and terror of a zombie outbreak. It's sweet and brief but so well written it could easily branch off into a title of its own. It's that good. 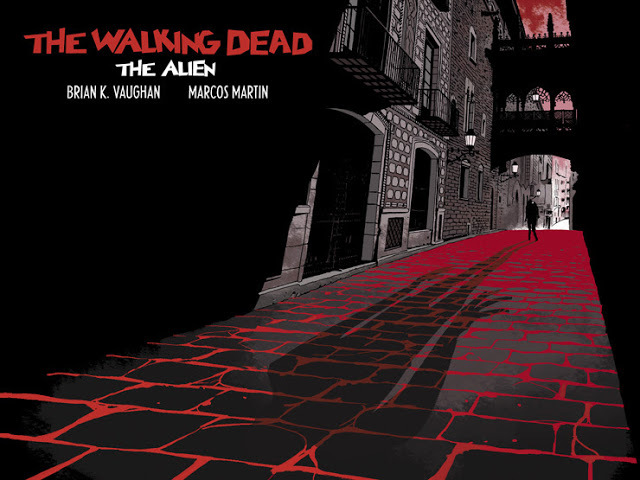 'The Walking Dead: The Alien' is a rare treat that honors its source but with a different voice. It seamlessly supplements TWD with an original gripping story that deserves to be read. With the name-your-own-price strategy, there's no excuse to miss this great one-shot from Panel Syndicate.